First-time Canadian author Franceen Neufeld is on a mission of rescue. 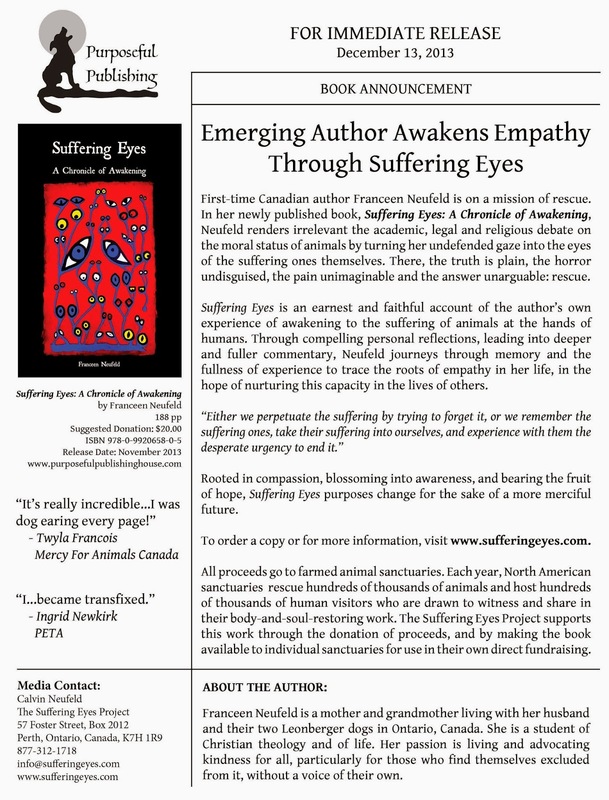 In her newly published book, Suffering Eyes: A Chronicle of Awakening, Neufeld renders irrelevant the academic, legal and religious debate on the moral status of animals by turning her undefended gaze into the eyes of the suffering ones themselves. There, the truth is plain, the horror undisguised, the pain unimaginable and the answer unarguable: rescue. Suffering Eyes is an earnest and faithful account of the author’s own experience of awakening to the suffering of animals at the hands of humans. Through compelling personal reflections, leading into deeper and fuller commentary, Neufeld journeys through memory and the fullness of experience to trace the roots of empathy in her life, in the hope of nurturing this capacity in the lives of others. Rooted in compassion, blossoming into awareness, and bearing the fruit of hope, Suffering Eyes purposes change for the sake of a more merciful future. To order a copy or for more information, visit www.sufferingeyes.com. All proceeds go to farmed animal sanctuaries. Each year, North American sanctuaries rescue hundreds of thousands of animals and host hundreds of thousands of human visitors who are drawn to witness and share in their body-and-soul-restoring work. The Suffering Eyes Project supports this work through the donation of proceeds, and by making the book available to individual sanctuaries for use in their own direct fundraising. Franceen Neufeld is a mother and grandmother living with her husband and their two Leonberger dogs in Ontario, Canada. She is a student of Christian theology and of life. Her passion is living and advocating kindness for all, particularly for those who find themselves excluded from it, without a voice of their own.